(Haymarket, VA ) VSA is proud to announce a new working partnership with Haymarket Physical Therapy. This partnership is VSA’s next step in the club’s commitment to developing players in all aspects of the game. Throughout this partnership, VSA staff, coaches and players will have access to athletic trainers and medical professionals at league games, injury prevention education, and regular injury screenings throughout competitive seasons. Haymarket Physical Therapy was started by Dr. Holly Moriarty, DC in 2008. She prided herself with making HPT a family oriented facility with an emphasis on patient care, customer service, and evidenced-based practice. From 2012 to present Haymarket Physical Therapy has been voted Best Physical Therapy in the Haymarket/Gainesville Region four years in a row. Winners are voted on by local citizens through the Haymarket Lifestyle Magazine. 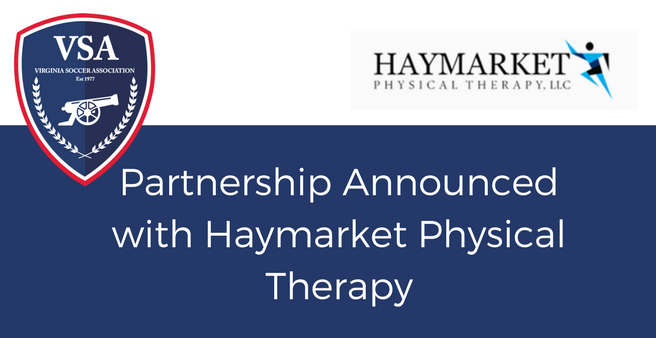 Matt Lacey, VSA Executive Director, had this to say about the new partnership, "We are extremely excited to announce Haymarket Physical Therapy as our new partner who will provide our players with real time injury feedback and provide a home for all players with physical therapy needs. We have spent a lot of time working towards creating a partnership to benefit our players and we are happy to commit our support to a local business, but more importantly, good people who want to invest their time and energy into our club. We have been very impressed with Rob Woelkers and his staff during the past few months of discussion." Dr. Robert Woelkers, PT, DPT, CSCS started working for Haymarket Physical Therapy back in December 2012. He quickly became one of our lead providers through his knowledge of rehab progression, hands on therapy and patient care. “Being able to screen injuries, put systems in place for early injury prevention, and shorten return to play time when injuries occur will significantly improve the overall playing experience. We are excited about the opportunity to serve all of the athletes and coaches associated with VSA”, Dr. Robert Woelkers. Throughout each season, Haymarket Physical Therapy will provide access to athletic trainers and medical professionals at training and games. This will provide consistent oversight and follow-up with VSA’s players in regards to existing injuries and injury prevention. This partnership is effective immediately.